Spain is one of the most popular destinations that AIR7SEAS provide freight services. We have wide range of freight service both via Air and Ocean freight specifically design to Spain. We take care of every process of the shipping, due to the safe delivery and unpacking of the goods, our dedicated team will even organize all packing and paperwork together with all those documents, leaving much time to focus on all the other areas of the move to Spain. If you are shipping cargo to Spain, it is important to note that there are some items you cannot ship to Spain. For example, you are not allowed to ship products made from protected species including ivory, reptile skin, tortoise shell, and wood from the Amazon. Other items that are prohibited or require special permits from the police in Spain include weapons and ammunition. If you are moving to Spain or plan to live in Spain for an extended period of time, you might decide to ship a motor vehicle to Spain. In order to ship a motor vehicle to Spain, you must own the motor vehicle for at least six months prior to shipping a motor vehicle to Spain. Further, if you ship a motor vehicle to Spain, the motor vehicle must be in good working condition upon arrival. There are some important documents you'll need before shipping a motor vehicle to Spain. Why choose AIR7SEAS for your shipping needs? 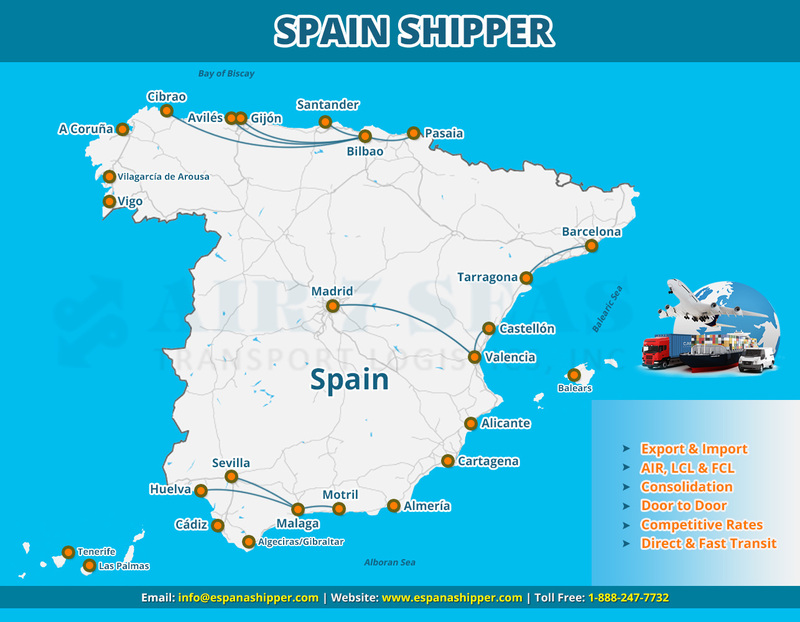 Cargo shipping to Spain is much easier with the help of a dependable and reliable cargo shipping company. Contact AIR7SEAS for more specific information about rules and regulations when shipping to Spain. Call AIR7SEAS toll free today at 1-888-247-7732 or Email us at: Sales(@)Air7seas.us with any questions you might have about cargo shipping to Spain or get free FREIGHT QUOTE for your cargo shipment to Spain. Information shown is as of August 2015. Subject to change without notice.